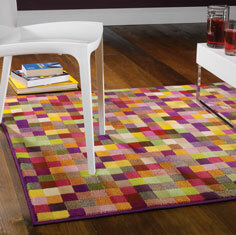 A Retro rug is a must have for any modern, funky and unconventional space. This bright and bold collection of designs would look perfect in a variety of different rooms, from the clean lines and monochrome colours of a minimalist living room to the old school design of a funky child’s bedroom. The strong colours and bold design of the Scooter, Road Trip and Bug rugs would look perfect on a hardwood or laminate floor and even in a high traffic area the quality of these long-lasting, stain resistant and hard wearing cheap rugs would really come through.